Here's my card for this week's My Favorite Things Wednesday Sketch Challenge. I put together an encouraging design based on the layout. I designed the card around the pretty patterned paper from an older Jillibean Soup pad. The paper's green undertones made it a nice match for the Factory Green card base. I cut a rectangular piece of the patterned paper and adhered it to the upper left corner of card base. Instead of an image, I used a die cut for my message. 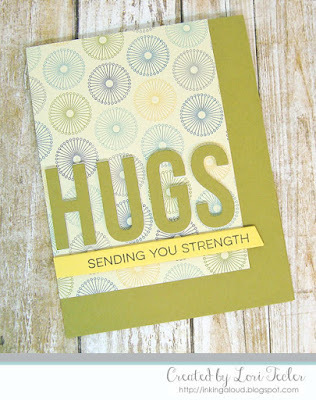 The Big Hugs die was cut from both Factory Green cardstock and from craft foam. After layering the pieces for dimension, I arranged them on the patterned paper, leaving space below for the slanted sentiment strip. I stamped the "sending you strength" sentiment from the Essential Sentiments stamp set on the golden yellow die cut strip in black ink, then adhered it beneath the die cut word with foam tape so it would be even with the large letters. Those large letters do a nice job of getting the message across! Maybe it's just my computer, but lately when I've come to check your blog, I cannot read your posts because the background has become the foreground. Is it just me? Forget that -- just discovered when clicking back to your posts that if I double click your blog header, the posts will have the white background. don't know what's going on but now know what to do. Should have entered a comment earlier so I could discover this! Hope all is well as you get ready for the new school year!